The Navy is developing a new diving helmet fitted with something called Divers Augmented Vision Display (DAVD). It’s essentially a fancy underwater HUD. But really, the whole setup basically looks like a high tech Minion costume. Having real-time operational data enables [divers] to be more effective and safe in their missions—providing expanded situational awareness and increased accuracy in navigating to a target such as a ship, downed aircraft, or other objects of interest. The Navy wants you to think that the DAVD system is basically a superhero tech. “By building this HUD directly inside the dive helmet instead of attaching a display on the outside, it can provide a capability similar to something from an Ironman movie,” Dennis Gallagher, an engineer working on the display, said. 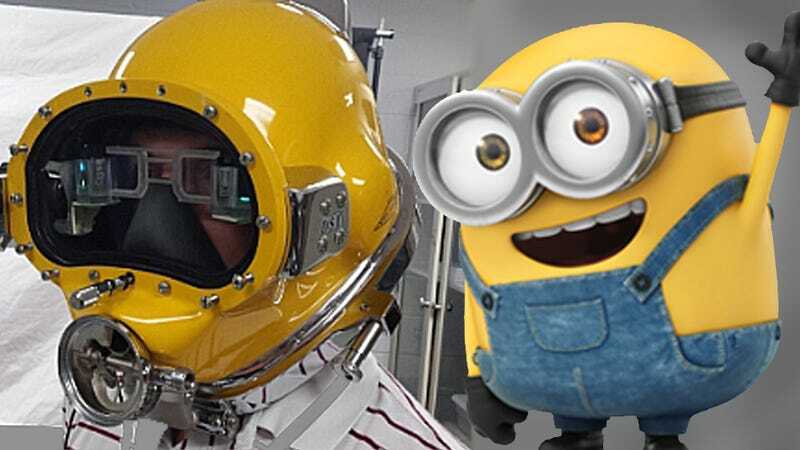 What he actually meant to say, probably, is that the helmet design was lifted from the Minions movie. According to the Navy, the display is still in the midst of testing, and Gallagher and his team are currently working on “phase two,” which involves additional helmet systems and full face masks. Divers are set to begin testing the gear in October. It may not beat the $400,000 F-35 helmet, but it will up the Navy’s street cred with elementary school children around the world.